Social media marketing is not a random whirlwind of people coming and going without a trace—remarking alone is a testament of that! Ha! Actually, social media marketing is a highly tracked place full of analytics, statistics, behaviors and trends! Everything on the internet is tracked from optimal times of engagement, likes and reactions, click through rates, demographics to even referral traffic! There are so many statistics to keep up on, many of which marketers are missing out on. Although social media is always evolving, social media stats can be useful in any marketing strategy! For example, 2017 has been an interesting year as attention spans have decreased to 8 seconds for most social media users. Knowing the change in attention spans can help marketers tighten their videos and overall presentations. Each day the number of social media users are increasing so why miss out on information you need to reach them? Being able to create content that reaches those numbers in 2018 will matter to your business! Helpful numbers to keep in consideration: The world population is 7.6 billion and the internet has 4.1 billion users. 77.6 million Instagram users are from US. Instagram is expected to generate about $1.5 billion in mobile advertising sales this year and $5 billion in 2018. More than 40 Billion photos have been uploaded to Instagram so far. When Instagram introduced videos, 5 million videos were uploaded in the first 24 hours. Average Facebook user has 155 “friends”. 56% of online Seniors aged 65+ are on Facebook and 63% are between age 50-64. 87% of online users of age 18-29 are on Facebook. 74% college graduates are on Facebook. Percent of 18-34 year old who check Facebook when they wake up is 48%. 56% of Twitter users $50,000 and more in year. Saudi Arabia has the highest percent of internet users who are active on Twitter. Median age of a Pinterest user is 40, however majority of active pinners are below 40. Half of Pinterest users is $50K or greater per year, with 10 percent of Pinteresting households making greater than $125K. 60% of Pinterest users are from US. Two-thirds of pins represent brands and products. 70% of LinkedIn users are from Outside of US. People under the age of 25 use Snapchat for 40 minutes on average every day, more than instagram’s latest stat for same demographic. 50% of Male College students share selfies on Snapchat, the number is higher in Female college students. 77% to be precise. Snapchat reaches 11% of Total US Digital population. More than 25% of UK Smartphone users are on Snapchat, in Norway the number goes up to 50%. Active Snapchatters open the app 18+ time every day. Total Number of Daily Active YouTube Users: 30+ million. YouTube TV Paying Subscribers: 300,000. Number of Videos Shared to Date: 5+ billion. Number of Users Creating Content Shared to Date: 50 million. Number of Videos Watched Per Day: 5 billion. Number of mobile YouTube views per day: 500 million. 62% of YouTube users are Males. 80% of YouTube users come from outside of the U.S.
YouTube services 88 countries in 76 languages (or 95% of all internet users). Statistics can give us important insights and course of actions that can help formulate an effective marketing plan. We have the numbers to track everything we wish to manipulate and highlight in our marketing actions! Utilize them, and you can change any business plan around for better success! But may we not lose sight of the true reason behind business. Stanley Marcus once said, “consumers are statistics, customers are people” and that is how we should use these numbers: to better serve and help our potential customers through our business and services. I am 100% agreed with all your points. Social media marketing is the highest quality medium which ensures highest quality business growth. Instagram is a social tool which helps to achieve a lot of traffic because of the above-mentioned points. Instagram is mobile responsive and very popular to use any marketing campaign whether it is visual or text. As you have said ‘Over 800 million people worldwide use Instagram every single month’ what more a marketer need to conduct a successful marketing campaign when this platform has a sufficient global reach. Thanks for stopping by and reading my article! I love your comment! I am glad you agree and you found this interesting too! I believe Instagram and Pinterest are the true key players in social media these days! Pinterest particularly is VERY under-used especially for eCommerce businesses! Thanks for your thoughts! This is some great information. I love all the details that are in it. Social Media is the wave of the future for business advertising. Info like this helps us understand why. Thanks Cydney! Thank you so much for the comment! I enjoyed collecting the data points as I think they are really helpful, especially with understanding social media better for marketing! Were there any favorite points? That seems like such a long time to me. I’d expect this number to be much lower. In fact, I am surprised that “four hours” was deemed acceptable by users too. Imagine walking into a business and waiting around for 10-20 mins and having the staff not engage with you – it would lead to outrage. I can’t wait for the 2019 data. I am curious to see if there is a shift or recognition of social media as the second storefront by business owners and if the standard for acceptable time to engagement is lowered. Keep up the good work! Yes, when I read that statistic I was shocked at the length as well. It would seem that since we are in a world of “instant gratification” that it should be within a two-hour window! Ha! I think you bring up a good point that businesses should view social media contacts as a type of “storefront” they should take seriously! I mean online shopping is even changing where people are buying directly from IG featured posts so I agree— I am sure there will be a shift. I think we see that with anew emergence of bots and other automated programs but I don’t know how I exactly feel about them yet for business. Hey great article. I went through it and I am surprised to see about how many things we are not aware of regarding the social sites we use in our daily lives. I know, it is shocking the power social media has in our personal but crazily enough, all of the aspects of our lives! What an eye-opening article. I wasn’t going to comment but my conscience would not let me leave without saying thanks. Good lies, damn lies, and statistics have always been the basis of a good argument. Great research and much appreciated I will reference it often. People are tired of being treated like they’re just another number/fan/follower. They want to have real, back and forth conversations, and to feel like they’re actually being heard and listened to. Real engagement and one-on-one conversations on social media will set your business apart from the competition. 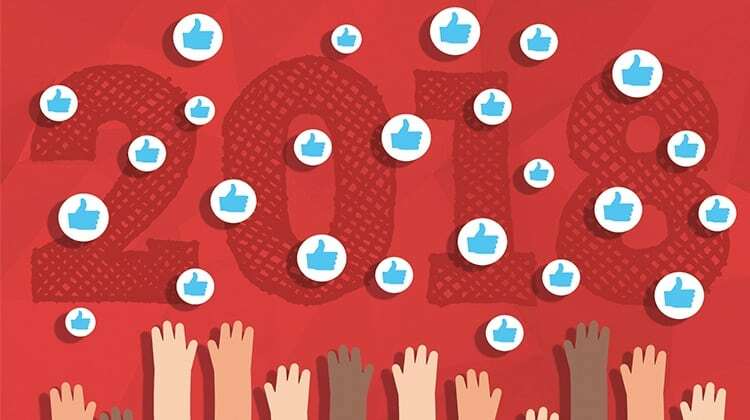 I’m excited to see what 2019 has in store when it comes to social media. Personalization and customization will be key for businesses to succeed in 2019 onward! Long gone are the days in which potential customers are treated as a cog in the business income system! Thanks for the awesome post. I have read the post and it’s very useful to me. I think they are really helpful, especially with understanding social media better for marketing. Thanks for stopping by and for reading my article! I am happy to hear you found it helpful! Understanding industry and marketing statistics really help shape your own marketing plans for more specific success! Which stat interested you the most? Great and very useful post! Keep reading the post like this further. Thanks so much! I am thrilled to know you found this helpful— we have tons of statistics-based articles so be sure you search “STATS” in our search bar to learn more!